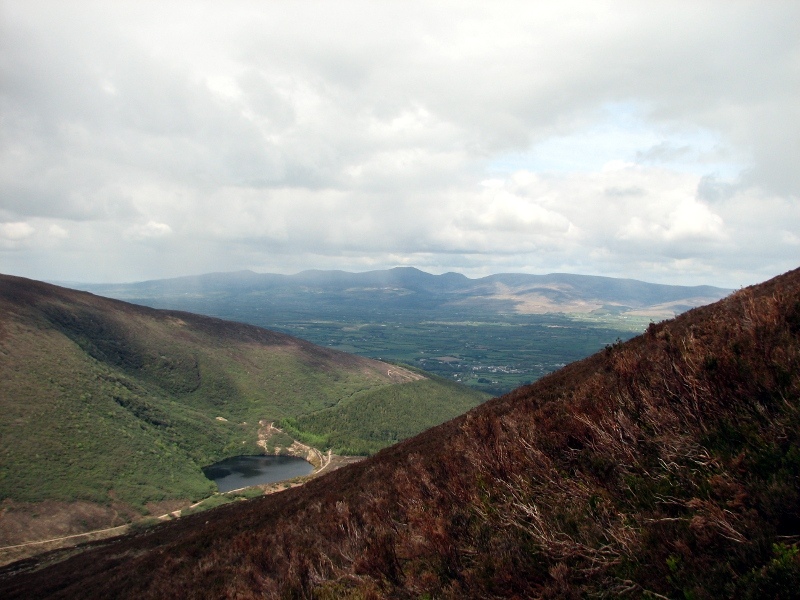 Knockmealdown reaches a height of 794 meters. 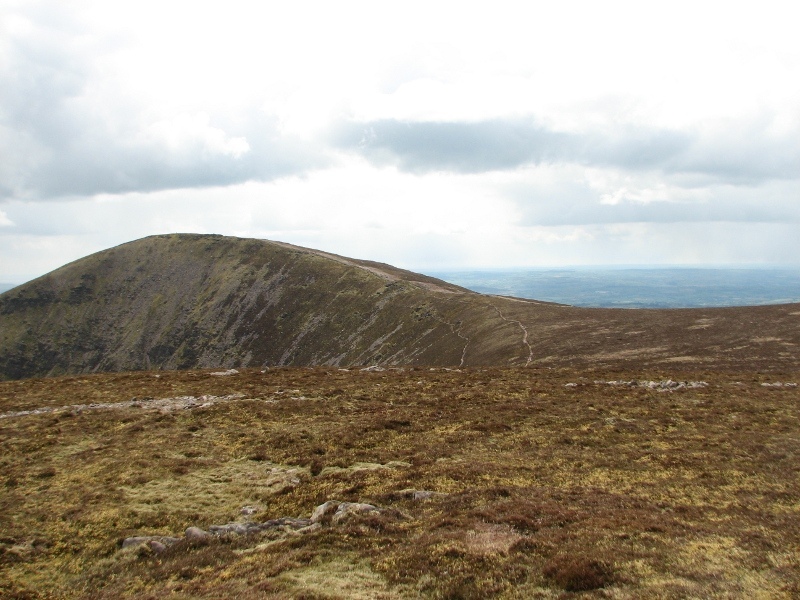 Straddling the border between Tipperary and Waterford, this peak forms the highest point in Waterford. It is situated in the mountains of the same name and provides for a great walk with interesting terrain and wonderful views. 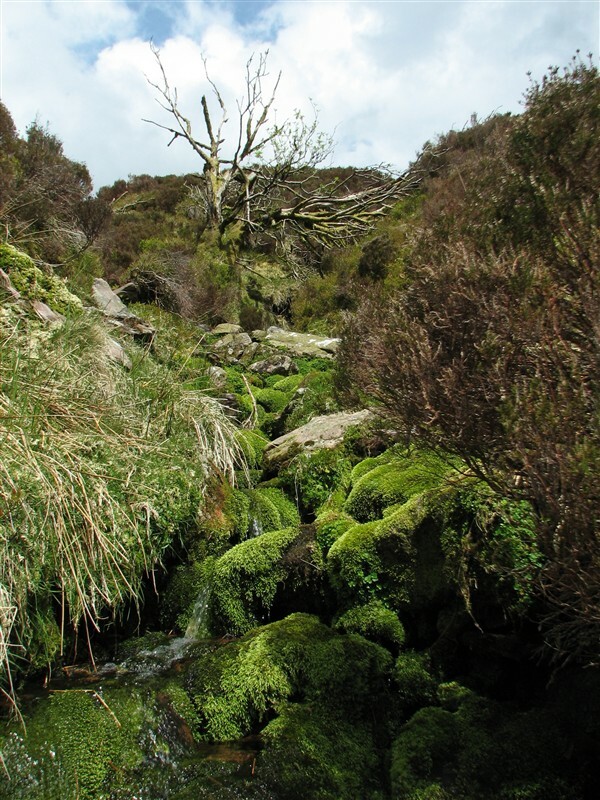 The Knockmealdowns are a tidy bunch of hills sandwiched between the larger Galtees to the North – North West and the Comeraghs to the East. For our walk we drove up past The Vee, an area that presents car-bound mortals with excellent views across the flat plain between the Knockmealdowns and the Galtees. However, we had greater heights and vistas in mind so we continued on for just a few minutes to the Bay Lough car park, situated at a pass between Sugarloaf Hill and an unnamed peak to the west. From here we crossed the road and started the steep ascent towards Sugarloaf Hill. The path follows the county line and is easy to follow. Due to the incline we gained height (and breathlessness) in no time. 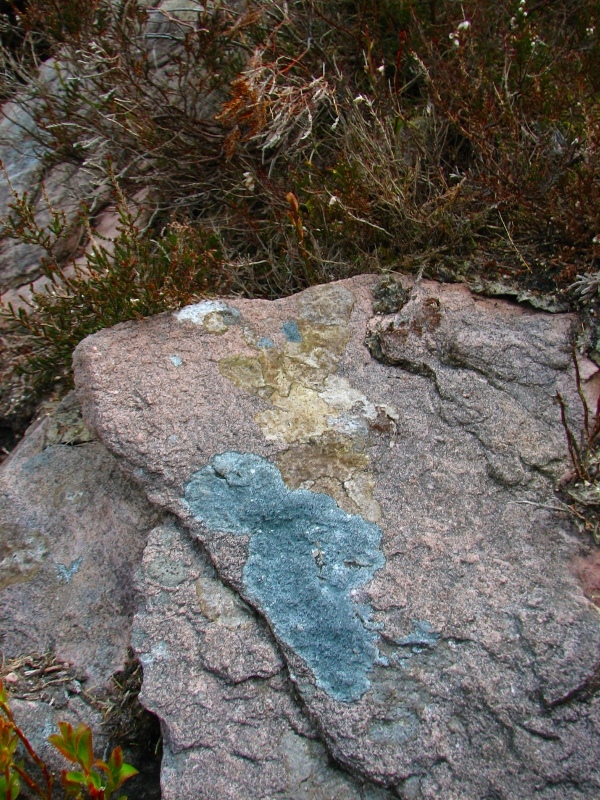 The first thing I noticed is that the rocks are Mauve to pink in colour, with splashes of powder blue lichen. I understand the predominant rock in the area is old red sandstone laid down hundreds of millions of years ago when this land was near the equator. The second thing we noticed was that we clearly weren’t so close to the equator anymore as it was snowing. In mid May. Just a light spit but interesting none-the-less. The climb to the top of Sugarloaf Hill is steep and takes about a half an hour or so. As such it’s not a gentle start to the day, but the reward is that once you reach the top you have done a significant chunk of the days ascent and your route towards Knockmealdown becomes clear. We followed the path, which traces the county boundary and took in the views of Lough Moylan to our left, watching the hail and snow bearing clouds come in from the north. Once we reach a high point near Knockmoylan [S054091] we took a left off the path and took the 7 minute walk to that peak. The diversion is worthwhile as it affords a view back towards Knockmealdown which makes clear just how steep the walls of the corrie that lies on the north-eastern side of the mountain are. Just a few more minutes brought us to the trig point at the top of the hill, where an ice-cold snow bearing wind was howling up the corrie walls. Luckily, a mere fifteen feet down the hill on the lee side we found that the ground was warm and dry. A perfect spot to take lunch while picking out distant places like Dungarvan, Youghal, the winding final miles of the Blackwater river and way off on the horizon some hills that may well have been in north Kerry. After lunch we decided against retracing our steps and instead headed back down towards the saddle near Knockmoylan before veering left down the hillside towards the Glentanagree Stream. 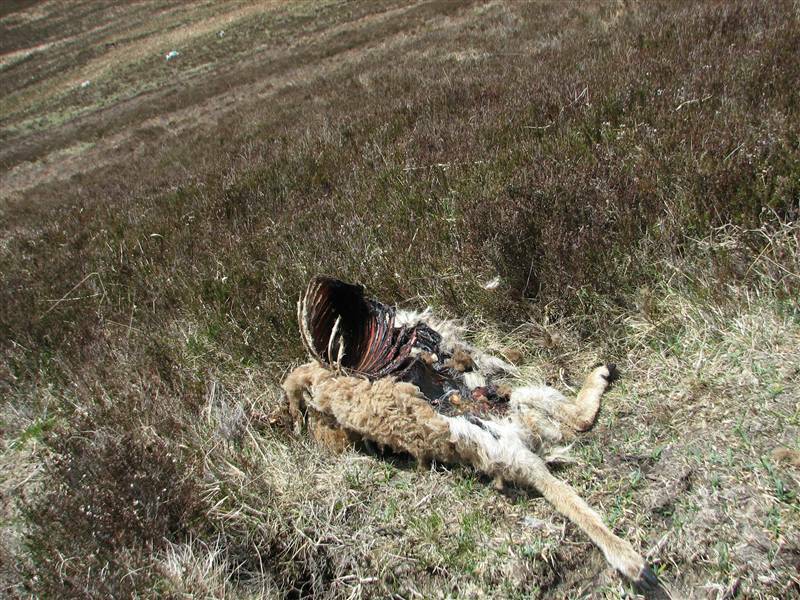 Here we startled a hare and followed our noses to the corpse of a goat that looked suspiciously like a kangaroo. Further down the slope we came to the stream which shelters an occassional lonely tree in hollows it has created over the ages, while lower still the hill was covered in large tracts of Rhododendrons, which gave the area quite an exotic feel given that I haven’t seen such plants on any of the hills I have visited to date. After a bit of way finding to get through the rhododendrons we emerged back onto the road and walked for 2 kilometers or so back to the car park, passing on the way a sad memorial to 4 dutch people killed here in a light aircraft crash in 1987. Use sheet 74 if you don’t want to end up like our friend Skippy. Note that I visited about 10 shops around Dublin before finding this map. In spite of the fact that it was published in 2008 it does not seem to be widely stocked. Here is the lowdown on Knockmealdown from Mountainviews. Just wondering what the ground is like from Sugarloaf Hill onwards? I will be down that way soon and am thinking of taking the trail runners and perhaps jogging that stretch if it’s suitable. Was up Sugarloaf a few weeks back but was an awful morning and was short of time so didn’t bother with the traverse to Knockmealdown. Ground is good. Eminently runnable from what I recall. 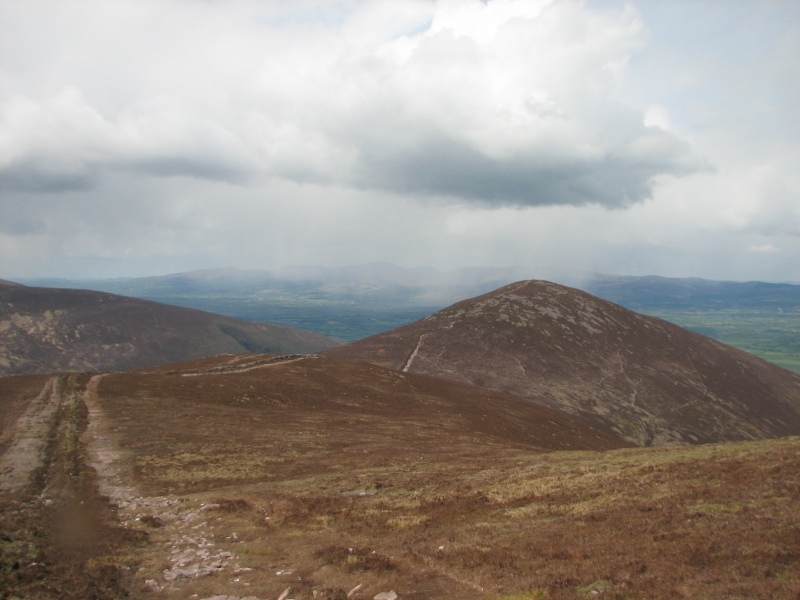 Coming down from Sugarloaf towards Knockmealdown might be a bit rocky but after that you could tackle the terrain at a run, or on a mountainbike. Bone dry when we were there too…I guess due to the pourous nature of the rock. As with the ascent, I don’t think you could run back down from Sugarloaf…or off the route we took down near the stream. Thanks for that. I do some work down that way on occassions so will head across one evening. Might be limited for time, hence the running! Any idea how long the walk took. Down that way this week and might try and do it one evening if time permits. 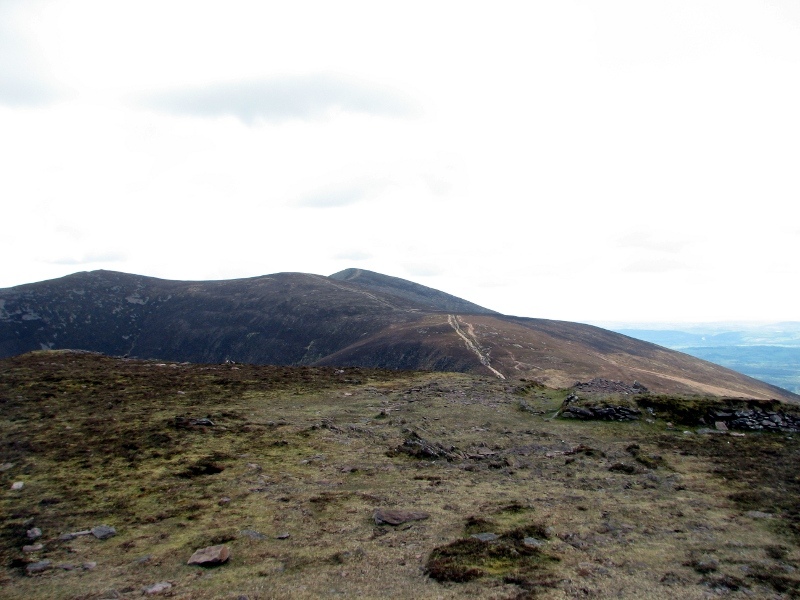 Thinking of parking under Sugarloaf, walking up that and following the wall across to Knockmealdown. Can then take the road back to the car. I see you have a GPS trace, does it tell you how long you were moving for? Those aren’t GPS tracks I’m afraid…the route is hand-drawn in Google maps. Given the amount of hanging around, lingering and loitering we did I’d say about 3 hours should cover you. We did find getting back to the road from Knockmealdown a bit tricky so you may encounter delays there.